The images and explanations here are linked to more details on other pages, but some videos are also available where you see the video icon. When a high voltage is applied across a gas at low pressure, the insulating properties of the gas can breakdown and conduct a current. When this occurs the gas will emit light. The colour of the light is unique to the type of gas or vapour. 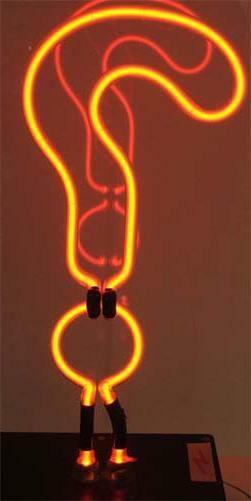 Neon gas seen here emits a red - orange light. In this neon tube the arc length is about 90cm long and requires 6kV to start it. The power supply is housed in the box at the base. Follow the link below for details on commercial discharge lighting. This is a very simple old 'Geissler' tube used for demonstrating electrical discharge through low pressure gas. In this instance, I think the gas is Argon. The tube is about 26 cm long and the evacuating seal is visible on the top right. A supply voltage of 4kV is required to run the tube. Geissler tubes are more usually ornate as in the lower example on the left. This example also contains a fluorescing liquid, in a second jacket, around part of the discharge tube. The liquid glows due to the UV content in the light from the discharge. 'Mouse over' the two images to see them running. The tube is shown running with an AC HF supply. Gas at low pressure is also used here. The applied high voltage is oscillating at a high frequency so even with one electrode, in the centre, the gas in the globe and the gas in the fluorescent tube are emitting light. The high voltage power supply is housed in the base of the globe and is similar to the type that drives television cathode ray tubes. Many gas and vapour arcs emit light of wavelengths which we can't see. 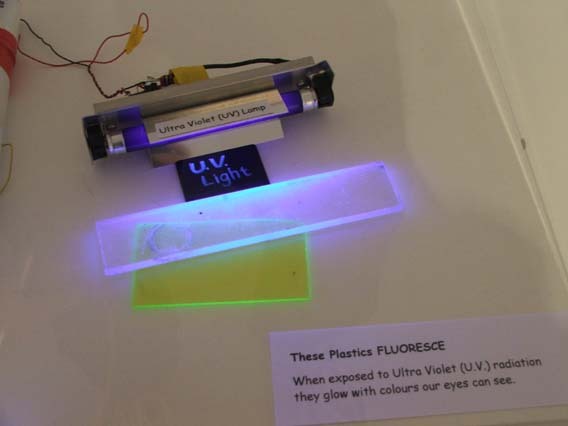 Ultra Violet (UV) is invisible but causes other materials to fluoresce. This small lamp produces Ultra Violet light from a mercury vapour discharge. The lamp is made from 'Woods' glass which filters most of the visible light out. You can just see the dark blue glow from it. The materials in front are fluorescing and emitting their own light, of a longer visible wavelength. 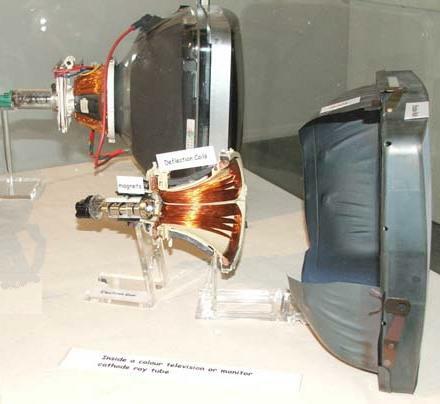 Until now the Cathode Ray Tube (CRT) has been the most popular electronic display. This picture shows a computer colour monitor CRT in the background. The main internal components are shown in front. From right to left is the electron gun, scan coils, shadow mask and shield assembly. Three electron beams are emitted from the gun assembly and deflected by the scan coils. The shadow mask ensures beam and colour phosphor registration on landing on the screen. CRTs employ very high anode voltages. This can be around 25kV. The high voltage connection is made via the cap on the cone of the tube seen on the background CRT with the red wire attached. The glass envelope maintains a high vacuum to allow electrons to travel to the screen. Most modern tubes are fitted with an implosion protection band which also is used to fix the tube in place. Care needs to be taken in handling CRTs not just because they can remain charged for a long time, but also due to the pressure on the glass envelope from the atmosphere. For loads more on cathode ray tubes and electron guns follow these links. This computer hard disk is from 1986 and is a 70Mb drive with an ESDI interface. The disk diameters are 5.25 inches and all 8 surfaces have read/write heads. The alternative 'mouse-over' image shows a 6x close-up of a Read/Write head. The small signal coil is just visible on the left of the ferrite head. For more Computer Stuff follow this link. This device produces microwave energy. The complete device is shown on the left and the working parts are shown on the right. Essentially, the device is a diode valve, or vacuum tube. The anode has compartments like spokes which form resonant cavities. Current flows around these compartments are caused by the magnets which can be seen removed on the right and in place on the left image. The fins on the left image are to help remove the heat from the anode. 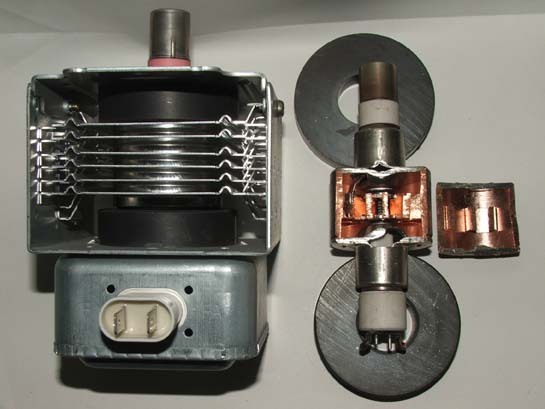 The heater and cathode connections can be seen on the box below. The box contains filters to prevent the microwave radiation being brought out via the wires. The radiation is emitted from the top antenna. For more Valves and Vacuum tubes follow the link. Optical fibre transmitter / receiver for computer networks. The receiver photo-transistor is on the top right. This assembly is a hybrid circuit. The circuit is printed on to a ceramic rather than a circuit board. Resistors are printed onto the ceramic rather than soldered. These can have their values trimmed by laser cutting. An example of this can just be seen on the black resistor to the bottom left of the receiver integrated circuit (IC). For more Electronic Components follow this link.